Over the years, our chillers have been subjected to the most critical on-the-job performance evaluations. The result has been proven reliability and a reputation for a solid quality machine. 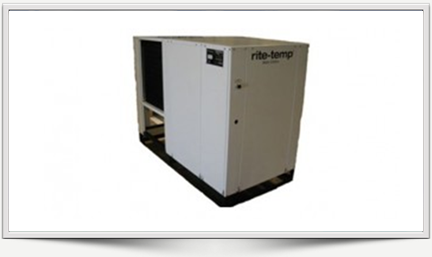 Rite-Temp manufactures chillers for a wide range of industrial and commercial applications. Flexibility of design and product adaptability set us apart in the industry. Each Rite-Temp Chiller must undergo a series of tests and pass our rigid quality assurance standards before leaving our plant. A solid, one-year warranty on parts and components, with five year on the original compressor. Straight forward and simple. We stand behind our products with years of experience and a technical staff always ready to assist you – our reputation depends on it. Completely self-contained, our fully automatic closed-loop system allows for a reduction in water usage, is easy to maintain and improves overall primary equipment efficiencies. Unlike open tank systems, our unique closed-tank design eliminates the problems of low or uncertain city water pressure, the possibility of contaminants entering the system, evaporation and overflow. 36,000 BTU/HR heat removal – 95F degree ambient,45F degree water out. Electrical: 460 / 60HZ / 3PH 24 volt electrical panel. Minimum Circuit Ampacity: 10; Maximum CircuitAmpacity: 18. 40 gallon, 16 gage, 304 stainless steel closed evaporator tank with coil inside. 1 HP water pump: 25 – 30 GPM, 30 – 35 PSI. Low ambient start-up package (standard). Analog water temperature and pressure gauges. Cabinet: 18 and 20 gage Phos coat galvanized steel finished with polyester powder coat. Base frame: 1/8 – inch angle & channel iron. Compressor: Copeland Hermetic (5 – year warranty). Approximate crated weight: 650 LBS. Physical dimensions: 30″ wide, 35″ long, and 66″ tall. Mirrors our standard vertical unit in features, except the condenser unit has been placed at floor level so that overall height is reduced. The horizontal system is an ideal solution for outside or rooftop installation for it has a lower profile enabling it to withstand high winds. 144,000 BTU/HR heat removal – 95F degree ambient,45F degree water out. Electrical: 460 / 60HZ / 3 PH 24 volt electrical panel. Minimum CircuitAmpacity: 27; Maximum Circuit Ampacity: 49. Dual compressor design: (2) 6 ton Copeland Scroll (5 – year warranty). Independent dual compressor operation for staged loads. Approximate crated weight: 1200 LBS. Physical dimensions: 58″ wide, 85″ long, and 47″ tall. The utmost in design flexibility. The cooling system has been separated into two parts – the condensing and evaporating units. 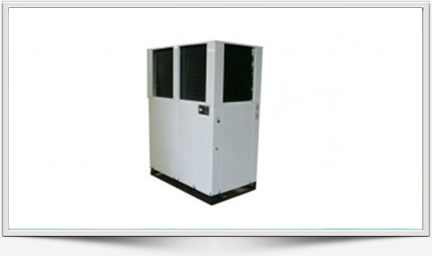 The condensing unit consists of the condenser coil and fan. The evaporating unit is made up of the evaporator tank and coil, compressor, water pump, electrical and control panels. Separating the two units and placing the condensing unit outside allows the condensing unit to operate more efficiently. CLOSED TANK DESIGN. This unique feature improves operating cost efficiencies, eliminates downtime due to contaminates entering the system and eliminates problems associated with low or uncertain city water pressure, evaporation and overflow. ENERGY SAVINGS. All 8 ton and larger units are equipped with multi-compressor systems that will operate independently as the load requires, resulting in energy savings. STAINLESS STEEL EVAPORATOR TANK. Our tank resists corrosion ensuring years of operation. FLEXIBILITY IN DESIGN. Choose from 2-to 20 ton units in vertical, horizontal, remote or our new portable design format, for optimum efficiency. Each unit is built one at a time to meet your manufacturing or commercial specifications. TESTING LABORATORY LISTED. All Rite-Temp chillers are certified to be listed by ETL Testing Laboratories, Inc.
REFRIGERATION SYSTEM. We form our own condenser coils and assemble them in­ house, use the industry respected Copeland compressor and engineer our own electrical and control panels using U.L. approved components. QUALITY ASSURANCE. Each Rite-Temp chiller must undergo a series of four separate tests and pass our rigid quality assurance standards before they leave our plant and arrive at your door. TECHNICAL SUPPORT. Whether you are needing technical support before or after thesale, our knowledgeable, professional staff are standing by to seNice your needs, toll-free foryour convenience. EXPERIENCE. At Rite-Temp, we have been building water chillers since 1948. 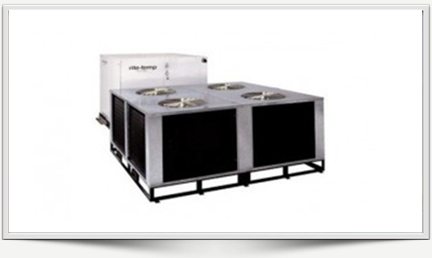 When you select a Rite-Temp chiller, you are quaranteed the best quality and most reliable system on the market. We are committed to manufacturing excellence and our reputation proves it. WARRANTY. We offer a solid warranty that is straightforward and simple-one year on parts and components and five years on the compressor.